When it comes to getting wet, some girls are just more enthusiastic than others. Mera is the princess of Atlantis, run from her home and looking for adventure on the surface world. Upon meeting the sailors of the Allies' naval forces, she decides to become their boon and protector, fighting for them in battle (so that their wives don't become widows) and using her looks and her powers to entertain them during the slow times. When her ex, Wonder Woman, wanted to help Steve Trevor escape Themyscira, Mera was the one she called for assistance. Mera is a flirty free-spirit who's only looking for fun. At least, that's the version of herself she shows everyone. The truth is, she's not just out in the world because she wants to be, she was banished by King Nereus, who also happens to be her brother-in-law. She lives on the surface because she has no home to go back to; she protects the sailors because she has no people of her own; she stays happy because it's her only alternative to breaking down completely. But she remains a hero, because when the choice comes down to letting people die or losing her own powers (and possibly her life), she doesn't even hesitate to do the right thing. After the Battle of Britain, she finds herself recuperating in a lighthouse on the Irish coast, where her caretaker is a surprisingly strong swimmer named Arthur Curry. As her feelings for him grow, she begins to understand the happiness she had, until then, only been faking. 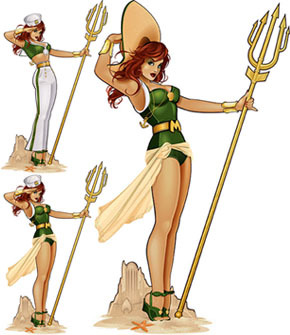 DC initially announced that Mera was going to join the Bombshells statue line in a rather unusual way: when they'd narrowed artist Ant Lucia's designs for the character down to three finalists, they put it to a vote among the fans; we were the ones who got to decide what she'd actually look like. The vote was close (the winning design got 38.8% of the votes, while the runner up got 37.9%), but the fans had spoken, and they got exactly the statue they wanted. And yet, action figure fans don't. The action figure is based on the third design in the poll, the one that got 23.3% of the votes. What? Why? Why would DC do that? The statue looks a certain way. The art in the comics looks that same way. But this toy breaks the pattern and looks like the least popular version of her? That doesn't seem like good planning. Hell, that's just dumb! The design may not be the one we would have preferred, but that doesn't mean sculptor Paul Harding didn't do his usual excellent job on the figure. It's fun seeing the different faces he gives these girls - Mera, for instance, has a narrow face, heavily lidded eyes and a small mouth that combine to make her look like Jane Krakowski playing a redheaded Jenna Maroney. The red used for her hair is a very dark color, not as vibrant as the red red used on Batwoman, but similar to Poison Ivy's. 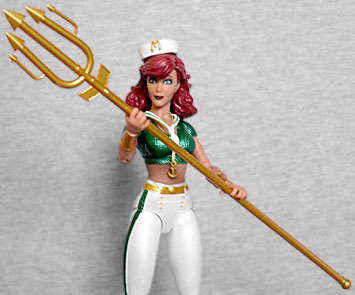 In every other medium, Mera wears a rather modest swimsuit with a billowing wrap around her waist, while this figure dresses her like a sailor, with high-waisted bellbottom pants and a little pill box hat. Yeah, it's easy to see why this design lost the vote. The green used for her scaly top is a nice metallic shade, matched by the stripes running down the outside of her pantlegs and the tops of her wedge sandals. She wears golden bracers, and has a necklace with an anchor hanging from it, and her belt buckle is a sea shell (though unless you already know that, it just looks like a normal circle. Additionally, the toy misinterprets the collar of her shirt as a separate scarf. Mera really highlights the quality decline evident in the second series of Bombshells figures. Her only accessory is her large spear. Yes, that's a rather important piece to have, but it should not be the only piece. If they'd chosen to do the proper costume, her big floppy sun hat could have been a separate piece. The art shows her posing in front of a sandcastle version of Atlantis, which would have made a really neat base for her to stand on. Water effects could have shown off her powers. Heck, even a single alternate right hand would have allowed her to salute, like the statue does! Instead, we get nothing but the spear, while the price remains the same. It's also worth remembering that the articulation has taken a dip: while the Series 2 figures still have swivel/hinge ankles, double-hinged knees, balljointed hips, an extra hinge in the hips to pull the legs down, a hinged waist, balljointed chest, swivel/hinge wrists, double-hinged elbows, swivel biceps, balljointed shoulders and a balljointed head, there's no sort of swivel in the thigh, a lack which really does a number on the poseability - you can reference all the sailor pin-ups you want, but being unable to turn the legs at all means there are some things the toy just won't be able to do. Maybe they were worried about the joint breaking the line of her pants' stripe, but again: not a problem if they'd done the right costume. Mera isn't a bad figure, but the choice of costume, coupled with the downgrading this line has undergone, make her less of a good figure than she could have been.